Internal browning, thought to result from CO2 injury, has been reported in Fuji, Cox's Orange Pippin, Braeburn and Jonathan apples. The disorder is associated with later harvested, large, and overmature fruit and with CO2 concentrations in storage. Higher concentrations of CO2 result in greater incidence and severity of internal browning. Incidence and severity of this disorder varies season to season and orchard to orchard. The reasons for this variability are unknown but some have suggested an association with cool, wet weather and high nitrogen fertilization. Because internal browning is not detectable externally, except in very severe cases, affected fruit can be discovered by buyers or consumers thereby affecting future confidence in the product. Although fruit susceptibility varies season to season and orchard to orchard, considerable losses of controlled atmosphere-stored fruit can result from this disorder. Brown discoloration in the flesh, firm but moist, usually originating in or near the core. Brown areas have well defined margins and may include dry cavities resulting from desiccation. Symptoms can range from a small spot of brown flesh to nearly the entire flesh being affected in severe cases. When the entire apple is affected, a margin of healthy, white flesh usually remains just below the skin. Symptoms develop early in storage and may increase in severity with extended storage time. Evidence to date indicates that internal browning occurs as a result of CO2 injury to the apple. Injury incidence and severity increase with increasing concentrations of CO2 in the storage atmosphere. Variability in susceptibility of apple varieties and in apples of different maturities may be due to anatomical differences (cell size, size of intercellular spaces) rather than biochemical differences. Later harvested fruit generally have greater susceptibility to internal browning and it has been shown in many fruit that diffusivity of CO2 decreases as fruit mature and ripen. A reduction in the ability of CO2 to diffuse out of the apple fruit would result in higher internal CO2 concentrations and thus more chance of injury. 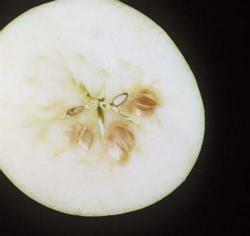 Internal browning can be more severe in fruit when watercore is also present. The accumulation of sorbitol in the intercellular spaces would result in reduced gas diffusion in the affected tissue. Some reports suggest that internal browning injury is more severe at 0°C (32°F) than at 2.2°C (36°F). CO2 solubility is greater at lower temperatures; however, the influence of temperature requires additional study before warmer storage temperatures could be safely recommended. Apple fruit can accumulate acetaldehyde and ethanol as well as various organic acids during exposure to high CO2 concentrations; however, it is not known if these are causal agents of fruit injury. Avoid harvesting overmature fruit. Harvest at the optimum maturity, especially for controlled atmosphere storage. Maintain CO2 concentrations below 1% in controlled atmosphere storage and air storage. CO2 concentrations of less than 0.5% are recommended for Fuji apples in California. Assure good air circulation in storage rooms to prevent pockets with higher CO2 concentrations. CO2 can develop to damaging levels in air storage or marine containers if fruit temperature is 3°C or warmer and ventilation is not good. Proper temperature management and good ventilation will prevent buildup of CO2. Avoid heavy wax coatings and thoroughly and rapidly cool fruit after waxing and packaging. Grant, J. A. and E. J. Mitcham. 1995. Internal browning of Fuji: Central California experiences. Proceedings of 11th Annual Washington Tree Fruit Postharvest conference, March 15 & 16, 1995. Matthais, J. P. 1995. Factors contributing to internal breakdown of Fuji apples. Washington State University Tree Fruit Postharvest Journal 6:3-4.